Vox has published a very helpful primer on all the new House committee chairs. I highly recommend that you take a quick look to see just how different things are going to be in this session. They may not be able to get the Senate to pass legislation or get the president to sign it, but they are going to do some oversight, goddamit, and not a moment too soon. Here are just a few. Click over for the whole list. Rep. Adam Schiff (D-CA) has already become well-known as Devin Nunes’s rival and foil atop the House Permanent Select Committee on Intelligence. But once he becomes chair, Schiff will be one of the most important figures setting the Democratic House’s investigatory agenda on Russia as well as other intelligence-related topics. Schiff plans to use his subpoena power to more intensely probe Trump’s ties to Russia, since Democrats think their GOP predecessors’ investigation of the subject was incurious, and concluded far too quickly. And one particular interest of his is in following the money. “One of the issues that has continued to concern me [is] the persistent allegations that the Trumps, when they couldn’t get money from US banks, were laundering Russian money,” Schiff recently said on the Lawfare Podcast. “If that is true, that would be a more powerful compromise than any salacious videotape or any aborted Trump Tower deal.” To that end, House Intelligence Committee Democrats are trying to hire money laundering and forensic accounting experts, the Daily Beast’s Betsy Woodruff and Spencer Ackerman reported. Schiff also thinks the administration’s North Korea policy is ripe for some oversight, and has questioned Trump’s rosy assessment of Kim Jong Un’s intentions. “The president keeps telling us that we can sleep well at night because North Korea is on the path to denuclearization, but I see no evidence of that,” he recently told Vox’s Alex Ward. The Committee on Oversight and Government Reform is the House’s main watchdog for the executive branch. But for the past two years, the Republicans running it have spent little time on oversight of Trump’s appointees. With incoming chair Rep. Elijah Cummings (D-MD), that’s about to change. Cummings has a mountain of potential subjects to investigate in the Trump administration, from Trump and his family’s own business entanglements with foreign governments to allegations of corruption and a revolving door in his administration. 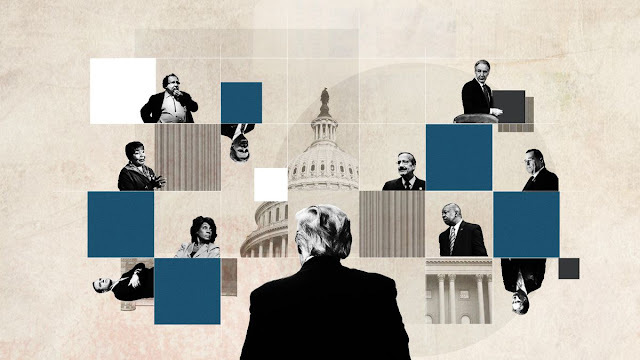 Over the past few years in the minority, Cummings and his staff have filed well over 50 subpoena requests for the Trump administration to Republicans — but because, they were in the minority, Democrats remained powerless to issue these subpoenas themselves. These involved investigating the administration’s response to Hurricane Maria, locating migrant children separated from their families by the Trump administration’s policies, investigating the ethical issues of Trump’s former Environmental Protection Agency chief Scott Pruitt, and more. If President Trump were to be impeached, the process would start in the House Judiciary Committee — which will be chaired by Rep. Jerry Nadler (D-NY). For now, Nadler plans to investigate what’s been going on at the Justice Department since Attorney General Jeff Sessions’s sudden firing and replacement with Matthew Whitaker. And he’s indicated he may reopen questions related to the sexual assault allegations against Supreme Court Justice Brett Kavanaugh. His committee also intends to take the lead on oversight of Trump’s immigration policy. Oversight of the Department of Homeland Security is fragmented, but the Judiciary Committee has pretty broad jurisdiction over Trump’s enforcement of immigration law. Given how aggressive the Trump administration has been in changing executive branch immigration policy, and how opaque or slapdash some of those moves have been, there is more than enough for Nadler to take up. Democrats’ questioning of Homeland Security Secretary Kirstjen Nielsen in December offered some hints about where Nadler and his committee would like to go, including the widespread family separations of late spring 2018 and the treatment of unaccompanied children in the custody of Health and Human Services. Nadler’s Judiciary Committee will also likely lend some investigative heft to Democratic appropriators’ efforts to cut funding for Immigration and Customs Enforcement arrests and detention. Immigration detention has exploded over the past two years despite Republican appropriators’ efforts to limit spending on it — so Democrats will likely ask questions about who is being detained, for how long, and why. Rep. Richard Neal (D-MA) hopes to get his hands on President Trump’s tax returns. He’s just not yet sure how or when, exactly, he’s going to do it. “Our staff is working on it,” Neal said in December. The Ways and Means Committee is one of the most powerful in the House, with jurisdiction over broad swaths of tax and health care. And Neal intends to scrutinize Trump administration policies about the Affordable Care Act, protections for preexisting conditions, and prescription drug pricing. But it’s the long-running mystery of what’s in Trump’s long-concealed tax returns — which he promised to release during the campaign and then didn’t — that Neal is asked about most often. That legal case may hinge on an obscure law from 1924 that says the Ways and Means Committee chair can request to the Treasury Department to review any individual’s tax returns in closed session. And even if and when the request is made, don’t expect Trump’s tax returns to be handed over right away — Neal has said he expects a court battle over the matter, and there are further questions about how exactly he’d be able to make informations in the tax returns public. As chair of the House Committee on Financial Services, Rep. Maxine Waters (D-CA) will have an opportunity to scrutinize broad swaths of the financial industry and agencies such as the Consumer Financial Protection Bureau and the Department of Housing and Urban Development. She’s also indicated she plans to target the megabank Wells Fargo and the credit score company Equifax. But, of course, she’ll also take aim at President Trump. In a letter to colleagues after the 2018 midterms, Waters said she intends to follow the “Trump money trail,” starting with Deutsche Bank — one of the few banks that still lend money to Trump and also does business with his son-in-law Jared Kushner — and “suspicious activity reports” filed with financial crimes officials. As ranking member of the committee, Waters sent letters asking about Trump’s financial ties with Russia and asked then-committee chair Jeb Hensarling (R-TX) to subpoena information on his ties to Deutsche Bank. As committee chair, she’ll have the ability to conduct investigations — and issue subpoenas — on a number of matters related to the Trump administration and Trump family’s finances, including potential ties to Deutsche Bank, Citibank, and Russia. Under Rep. Eliot Engel (D-NY), the Foreign Affairs Committee plans to dig into Trump’s connections abroad and whether his business interests might be influencing the administration’s policies. In addition to the obvious topic of Russia, the committee hopes to obtain more documents about the Trump Organization’s property in Panama. Earlier this year, Trump’s company appealed directly to Panama’s president to stop its eviction from the building as managers. Some say that episode shows a clear conflict of interest between Trump’s duty as president and his ties — since severed — to his namesake company. Greater oversight of the State Department and the US Agency for International Development (USAID). The committee is particularly interested in looking into reported “loyalty tests,” where officials are vetted for their loyalty to Trump. Updating authorizations for the use of military force abroad, which have remained untouched since 2002. Ending America’s support for the war in Yemen, a move for which there is has been growing congressional support. They are going to be very busy.